UNIVERSAL PERFORMANCE STAINLESS STEEL TAILPIPE 2" INLET 3" OUTLET. High quality Universal Performance Stainless Steel Exhaust Tailpipe Trim. Quality grade stainless steel. Accessories such as brackets and fixings. Lambda Sensors. End Silencer. Belt Tensioner Wheels & Bkts. Suspension Ball Joints. Any claims after 24 hours cannot be accepted. Rear Lights. Front Exhausts Cats. Estimates can be provided beforehand but prices may differ upon ordering. 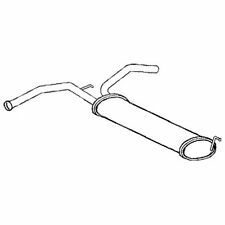 EXHAUST PIPE CITROEN C1 1 143013 C1 EXHAUST PIPE. Reference OE/OEM Numbers: 1717CY, 143013. Useful Links. UNIVERSAL PERFORMANCE STAINLESS STEEL TAILPIPE TRIM 3" INLET. This is a Single high quality Universal Performance Stainless Steel Exhaust Tailpipe Trim with 3" Inlet & 100 mm Outlet. Tailpipe Length : 200 mm. 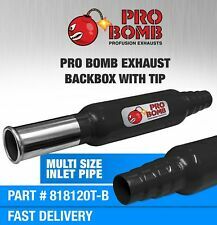 REAR END SILENCER fits PEUGEOT 107 Hatchback - 05> - EXH190940. Modell C1, 107, Aygo. Modellreihe C1, 107, Aygo. Citroen C1 1.0 i 12V 06/05-08/09 998 68 50 yes 384F1KR-FE | PMCFAC, PNCFAC 3001-872. Peugeot 107 1.0 i 12V 06/05-08/09 998 68 50 yes 384F1KR-FE | PMCFAC, PNCFAC 3003-151. This Exhaust Part corresponds to the image provided and also to the vehicle as displayed in the compatibility guide above. If you are unsure of anything, just click contact us - we will need your car registration number so that we can double-check for you before you buy. If this is not sent before purchase we will assume you have purchased the correct item and dispatch the system for you. This part is supplied WITHOUT fittings - they are displayed on the image for information purposes only. However, a fitting kit is available for this product should you need to add it to your order. Other parts of this exhaust system are also available. End Silencer. Belt Tensioner Wheels & Bkts. Suspension Ball Joints. Any claims after 24 hours cannot be accepted. Rear Lights. Front Exhausts Cats. Estimates can be provided beforehand but prices may differ upon ordering. 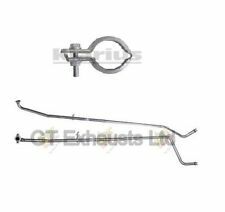 REAR END SILENCER CITROEN C1 190940 C1 REAR END SILENCER. Reference OE/OEM Numbers: 1730FP, 1730H0, 1730JF, 174300Q010, 190940. This part will fit Ending Soon. Surface finished : polished. Exhaust tip has corrosion resistance to alkali solution and most organic and inorganic acids. Perfectly decorate the exhaust pipe of your car. Body Type:76mm/3" Round. Reference OE/OEM Numbers: 1726XY, 1726XZ, 1730H0, 1730H0, 174300Q010, 174300Q011, 174300Q012, 174300Q013, ADT36015. This part will fit. 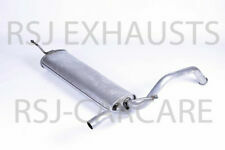 Rear Muffler fits PEUGEOT 107 Hatchback - 05> - ADT36015. Citroën C 1 Peugeot 107 Toyota Aygo exhaust silencer. Modell C1, 107, Aygo. Modellreihe C1, 107, Aygo. Citroen C1 1.0 i 12V 06/05-08/09 998 68 50 yes 384F1KR-FE | PMCFAC, PNCFAC 3001-872. PEUGEOT 107 1.0 i 12V 06/05-08/09 998 68 50 yes 384F1KR-FE | PMCFAC, PNCFAC 3003-151. 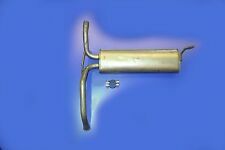 Universal Exhaust Dissipative Muffler 304 Stainless Steel 2.5" Inelt 2.5" Outlet. Material: Stainless Steel. Perfectly decorate the exhaust pipe of your car. Exhaust tip has corrosion resistance to alkali solution and most organic and inorganic acids. 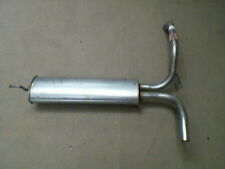 UNIVERSAL PERFORMANCE STAINLESS STEEL TAILPIPE LEFT 2.5" INLET 3" OUTLET. High quality Universal Performance Stainless Steel Exhaust Tailpipe Trim Left. Quality grade stainless steel. Accessories such as brackets and fixings.